✔ 1 Years' Warranty + Lifetime Technical Support via E-mail. ✔ With OS updated to the latest Android 7.1.2 version, 2018 Upgraded S912 Smart Android TV Box is coupled with the rapid and stable configuration. 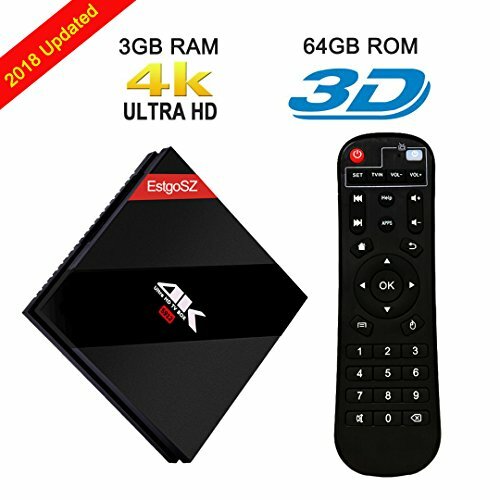 ✌The Increased Memory: EstgoSZ TV BOX configuration is 3G RAM (memory) + 64G ROM store, 3G is used to support the machine running system, 64G is used to storage all which you choose and download. Totally Enough! ✌Fast & Furious: Please ensure that the stable and quick network, with the help of built in dual-band wifi and Ethernet 1000M, can get you more. Faster speed, more operations, when you are playing game! Bluetooth 4.1 Pairing may be that what you want!